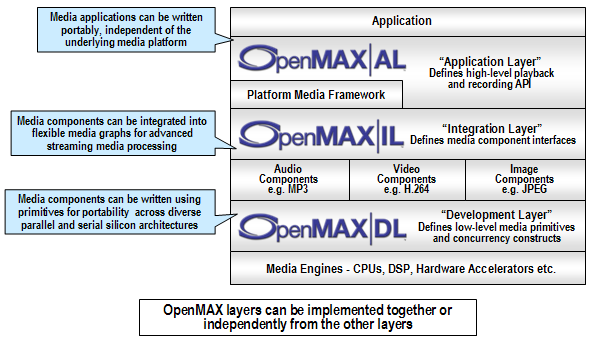 OpenMAX DL (Development Layer) APIs contains a comprehensive set of audio, video and imaging functions that can be implemented and optimized on new CPUs , hardware engines, and DSPs and then used for a wide range of accelerated codec functionality such as MPEG-4, H.264, MP3, AAC and JPEG. OpenMAX DL 1.0.2 includes clarifications and corrections to the previous version (1.0.1). All implementations should aim to match this version for interoperability. One of the key challenges with all of these architectural variants is to develop efficient code. Even though compilers are generally provided, it is rare to be able to exploit the full potential of the entire architecture from a high-level programming language. The outcome is that large portions of the application are often written in assembly language to specifically target the hardware platform. The proliferation of different multimedia hardware solutions means that software must be re-written and optimized for each new platform that it is ported to. The effect of this inefficiency in implementation is to delay the introduction of new products, increase development costs and reduce product quality, which ultimately slows down innovation in the multimedia domain at a time when market demand is growing. To address this issue, the OpenMAX Working Group has been formed by the Khronos Group, to define a set of standard, open Application Programming Interfaces (APIs) for multimedia applications. The goal of this open standard is to reduce the cost and complexity of porting multimedia software to new processors and architectures. By agreeing a common specification for middleware applications such as multimedia codecs, graphics libraries and other functions for video, image, audio, voice and speech, it will be possible for the developer community to focus on differentiating their products rather than the repeated implementation of common functionality. This will ensure that new products can be brought to market sooner, and will support a broader range of hardware platforms. OpenMAX AL provides a standardized interface between an application and multimedia middleware, where multimedia middleware provides the services needed to perform expected API functionality. OpenMAX AL provides application portability with regards to the multimedia interface. OpenMAX IL serves as a low-level interface for audio, video, and imaging codecs used in embedded and/or mobile devices. It gives applications and media frameworks the ability to interface with multimedia codecs and supporting components (i.e., sources and sinks) in a unified manner. The codecs themselves may be any combination of hardware or software and are completely transparent to the user. Without a standardized interface of this nature, codec vendors must write to proprietary or closed interfaces to integrate into mobile devices. The principal goal of the IL is to give codecs a degree of system abstraction using a specialized arsenal of features, honed to combat the problem of portability among many vastly different media systems. OpenMAX DL defines an API which contains a comprehensive set of audio, video and imaging functions that can be implemented and optimized on new processors by silicon vendors and then used by codec vendors to code a wide range of codec functionality. It includes audio signal processing functions such as FFTs and filters, imaging processing primitives such as color space conversion and video processing primitives to enable the optimized implementation of codecs such as MPEG-4, H.264, MP3, AAC and JPEG. OpenMAX supports acceleration concurrency via both iDL, which uses OpenMAX IL constructs, and aDL which adds asynchronous interfaces to the OpenMAX DL API. OpenMAX is a non-proprietary, royalty-free standard, primarily targeted at middleware developers producing multimedia codecs, games engines and graphics libraries. OpenMAX is widely applicable to all applications where multimedia performance is a critical issue, including smartphones, games consoles, digital televisions and set-top boxes. Through collaboration and support from a growing number of leading stakeholders, the standard will be developed and promoted, with wide industry support and adoption encouraged. The working group welcomes the input and experience of existing Khronos members, and encourages new members with multimedia knowledge to join and help ensure that the specifications deliver benefits that are relevant to the entire industry. This includes semiconductor manufacturers, independent software vendors, intellectual property vendors, operating system companies and the OEM or product development companies that supply end users.